The La Marmotte Hotels-Chalets de Tradition is a 4 Star Hotel in The French Alps. Features include swimming pool. Ideal for exploring The French Alps. Welcome to the La Marmotte Hotels-Chalets de Traditionin Les Gets. 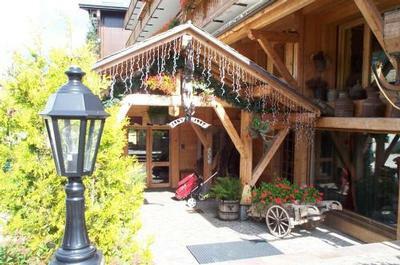 This chalet is located in the centre of Les Gets, opposite the ski slopes and ski lifts of the Portes du Soleil. The resort has an indoor heated swimming pool and offers spa facilities. For more information on the La Marmotte Hotels-Chalets de Tradition French Alps please click on the availability link above and below. Ce chalet se situe dans le centre des Gets, a proximite des pistes de ski et des remontees mecaniques des Portes du Soleil. Il propose une piscine interieure chauffee et un espace spa. The La Marmotte Hotels-Chalets de Tradition, 4 Star Hotel is in Les Gets, Haute-Savoie, Rhone-Alps, France. The address is 61, rue du Chene, Les Gets, 74260.